Why Not? Because I Said So! Book Reviews, Blitzs, Giveaways, and Author Interviews. : Escape to Everly Manor By Chalon Linton: Blog Tour Review and $25 Giveaway: Enter Now! 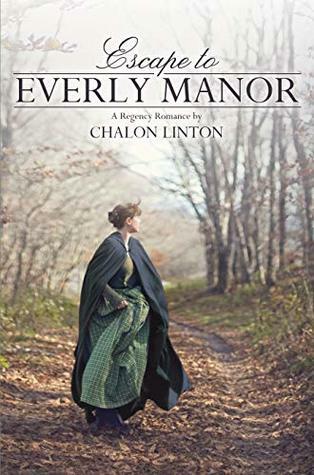 Escape to Everly Manor By Chalon Linton: Blog Tour Review and $25 Giveaway: Enter Now! I truly liked Escape to Everly Manor. This Regency Romance has adventure,romance,angst,and enough mystery to keep the reader guessing. Lizzy from the start is taking care of her younger brother who is being threatened to be sent to sea as a cabin boy, while she is being forced into a loveless marriage to an older man, Mr.Simpkin. Lizzy and Thomas are orphans and their very evil and slimy Uncle wants them gone and will stop at nothing to get what he wants. Lizzy and Thomas escape and while on the run find an old cabin to stay at for awhile. During this time they meet Mr. Barton and from there things start getting interesting. I loved the characters of Thomas, Lizzy's younger brother, and Mr. Barton AKA The Earl of Everly. The relationship between these two characters was my absolute favorite. From the very first you could see that Barton was a kind and very good man. Lizzy is hiding so many secrets that the possible relationship between Lizzy and Barton takes a long time to develop, which truthfully is not a bad thing. There are a few times I wanted to shout at Lizzy to give Barton/Harrison/Earl of Everly a chance. I think the thing I liked most about this Regency Romance is that the story wasn't just centered around a romantic pairing. So much of the story revolved around Lizzy's love and loyalty to her brother and always doing the right thing for him. This was a key thing to endear Lizzy to this reader. The novel also has it's share of unlikable people in the form of Uncle Cline, Mr. Simpkin, and sadly Barton's mother. Overall, I enjoyed reading this clean romance with it's unique plot. There are enough things to get you excited about, boo at, and also sigh at all of the right places. This is a must read for any Regency Romance reader. Labels: Escape to Everly Manor By Chalon Linton: Blog Tour Review and $25 Giveaway: Enter Now!